LYNX Handheld ERB-6 with high-end UHF utilizes omni-directional ceramic chip Antenna, which can be targeted to read 200 UHF tags within 3m simultaneously and single tag reading distance reaches up to 8 m.
It can be applied in quick in and ex-warehouse management, quick handover and inventory and etc. LYNX Handheld ERB-6 utilizes 3.5inch industrial transflective screen with 240(W)×320(L) (QVGA), which is displayed clearly and is vividly coloured. LYNX Handheld ERB-6 with high-end UHF utilizes omni-directional ceramic chip Antenna, which can be targeted to read 200 UHF tags within 3m simultaneously and single tag reading distance reaches up to 8 m. Reading range is wider and speed is faster. At the same time reduce the misreading rate. This can greatly save the staff’s time to arrange the goods and improve work efficiency. It also supports data collection and many radio communication ways. You can choose it freely according to the needs of your business. omni-directional antenna and Multi-tag reading : Handheld ERB-6 with high-end UHF utilizes omni-directional ceramic chip Antenna, which can be targeted to read 200 UHF tags within 3m simultaneously and single tag reading distance reaches up to 8 m and write distance ranges 0-4m. Effectively reduce the misreading rate. Support different tags scanning : Support the industry’s most professional scan engine, which has options of 1D scan engine, SE955-I100 and 2D scan engines, SE5100-SR, SE5100-SF, SE4500-SR or EA30DPM. 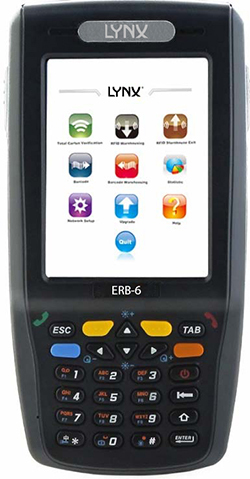 Handheld ERB-6 can accurately and quickly collect data. Small and portable : Handheld ERB-6 just weights 530g (with full configurations), which is almost half of counterparts. It is small and portable. Support the comprehensive function and wide application scope : besides Handheld ERB-6 supports UHF, it also integrated with 1D or 2D scan engines, camera, GPS, etc. and supports radio communications, including WIFI, GPRS, EVDO, WCDMA, HSDPA, HSPA+ and bluetooth. It can meet wide use in the industry. Line never drops to ensure that the data communication is smooth. Customized frequency : it provides customized frequency ranged 840 -960M. Stable OS to ensure continuous work : Handheld ERB-6 support 4 types of OS, WinCE5.0/6.0 or Windows Mobile6.1/6.5, which can meet different platform, needs of framework for software running and docking in the full industries.Unique ROM storage technology ensures stable running OS.